Industrial building made from architectural design that may be used for warehouse, factory, manufacturing etc. Building has parking, office, administration facility, loading area. 3dsmax full scene that renders as attached previews. No postprocessing of any kind. Exactly the same materials prepared for default 3dsmax scanline renderer & Maxwell Render and a lot other formats. All materials in textured formats have also alpha channels. Most materials with bump maps, normal maps, specular maps, alpha channels. High resolution textures. This formats makes it usable in 99% of 3D software programs. Every format of this model has been verified in software that is designed for and has no errors. By using this model in your project you are sure to please your client with a modern & proper architectural design of a industrial building. 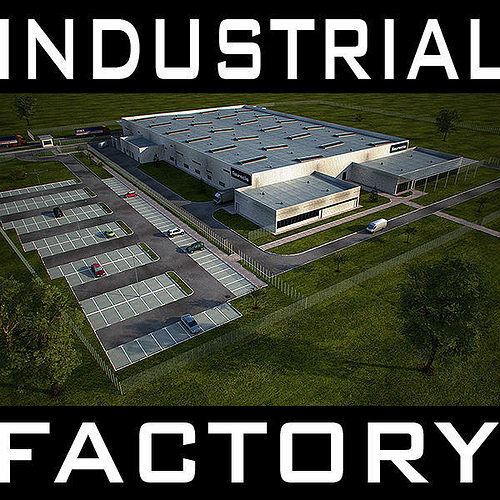 Also check out my other industrial building models, just click on my user name to see complete gallery.